Run 2 programmes at once! 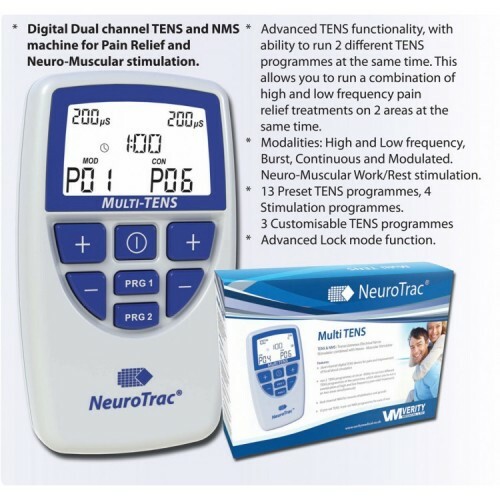 Ability to run two different TENS programmes at the same time, which allows you to run a combination of high and low frequency pain relief treatments on two areas at the same time. For example, you can use channel 1 to release pain relieving endorphins in the area of where the pain occurs. At the same time, use channel 2 for triggering the pain gate mechanism, placing your electrodes on the meridian near the vertebra. Endorphins and gate mechanism are targeted with different combinations of stimulus at the same time, this is where MultiTENS is very useful. Better LCD: An improved clear bright backlight LCD allows the display to be read more easily in low light or dark conditions. Better Keypad: An improved keypad with bigger keys for ease of use. Comprehensive Statistics: The statistics are backed up by am internal calendar system. When locked, the unit record up to 5sessions daily for up to 60 days. 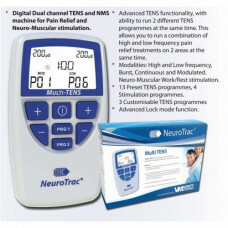 An easy to use menu system allows the therapistto review the statistics to ensure that the patient is using the unit correctly.